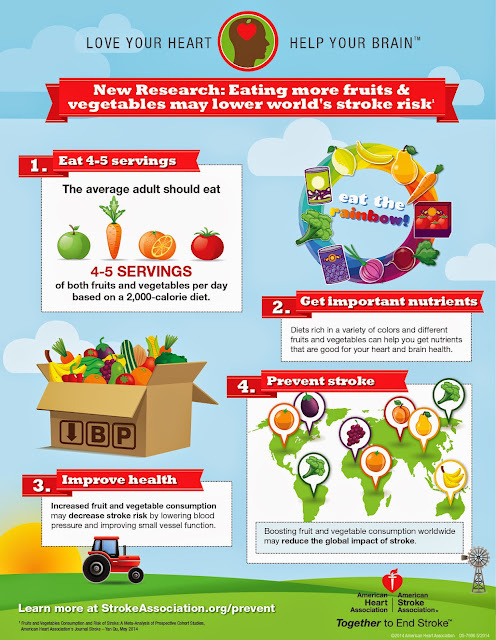 As part of their "Love your heart, help your brain" campaign, the American Heart Association and the American Stroke Association (AHA/ASA) released a new infographic highlighting the benefits of eating fruits and vegetables. The infographic cites new research that drives home the fact that eating fruits and vegetables, around 4 to 5 servings a day based on a 2000 calorie diet, may prevent the risk of stroke and improve health. The campaign aims to boost the consumption of fruits and vegetables worldwide to reduce the global impact of stroke. Learn more about how to understand more about the risk factors that affect stroke at StrokeAssociation.org/prevent.